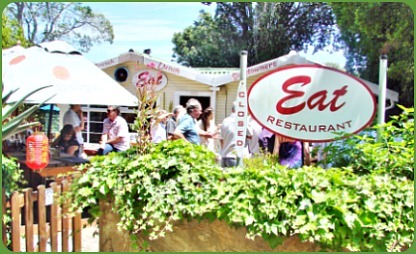 EAT Restaurant welcomed Sedgefield’s Slow Food Convivium to outdoor dining on a sublime summer’s day as they hosted a Southeast Asian street-food theme. Its' chef, Garth Beeslaar, has spent some time in Vietnam working in a 5-star hotel that had both eastern and western kitchens. He said that because the French had arrived in the country before the Americans, the Vietnamese food had been imbued to some extent with French classical flavours. 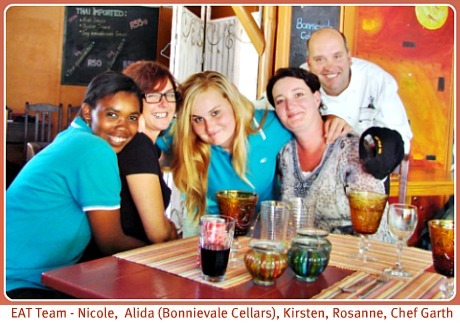 Although he had needed an interpreter to communicate, Garth was greatly impressed by the work ethic of the people, their service, their high standards and the freshness of their food. Garth said that he lost 14kgs in his first three months there. Eating like the locals do and having little meat in his diet, he found himself slimmer and full of energy. His time in Vietnam had been an uplifting experience as he was humbled by the Vietnamese capacity to work extremely hard, the willingness of the people to please and their happy positive attitude. His pastry chef for example, started work at 4am in the morning. When she finished at the hotel she worked in her father’s fields in the afternoon and in the evening attended university. Colin Capon thanked Garth for agreeing to host this SLOW Food lunch saying that all the ingredients were available in South Africa and it was good to have the opportunity to introduce new flavours and taste experiences to Sedgefield diners. 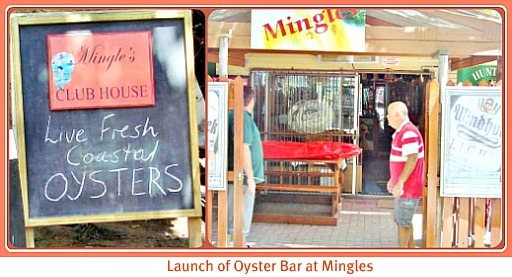 Next door to EAT, Rob of Mingles Pub chose the day to launch his Oyster Bar and supplied EAT with fresh coastal oysters that Colin Capon chose to barbeque and serve with ginger and Teriyaki sauce. Jason Marsden who is part of the oyster venture explained to me that they dive for the wild oysters on the rocks below the water line between Platbank (outside the Marine Protected Area) and Wilderness. Regulations state that neither scuba tanks nor flippers are to be used. This is in order avoid interference with the mother beds – the breeding oysters. The divers wear weight belts, gumboots, masks and snorkels using sharp metal posts to lever the shells from the rocks. A reasonably sized oyster is roughly 2 years old. He says that as currents move the sand all the time it banks up and covers different rocky areas so it ends up that the oysters have plenty of time to rejuvenate in places where they have been harvested. The oysters are brought back to specially prepared tanks that constantly spray a special formulation of salt water on them that also contains nutrients to feed them. They can be kept fresh like this for 3 months and longer. It is unlikely that they will be there that long as they are sold on a first in, first out basis. Gunther Schutz who also willingly supported our 2011 Slow Festival, cheerfully brought the Mitchell’s brand of beer along to present to the Slow Food lunch. Chef Colin Capon said that to his mind, beer complemented Asian food better than wine. In 1983 he moved it to Thesen House and established Mitchell’s Brewery. In 1985 the size of the plant quadrupled to 5000 litres per day after it was moved to the Industrial area. In 1998 it was sold to Scottish and Newcastle (a massive brewing group in the UK). In 2002 it was bought back again. There are no preservatives or additives in Mitchell’s beer and the bubbles are natural as no foaming agent is used. The varieties of beer are created by roasting the malted barley for different lengths of time. Hops pellets are added at the rate of 1.5kgs to 2000 litres of beer. It was then time to try out some South-east Asian food! Joe Slaviero from Puccis had been busy for a while frying fish bites in tumeric batter to be served with boiled rice and sweet and sour sauce. Colin had prepared beforehand slow Farchiew-style roast pork belly with oriental spices. He got busy barbequing fresh coastal oysters from Mingles with ginger and Teriyaki sauce. Garth worked really hard there and then for almost 2 hours using 2 woks to stir-fry combinations of chicken pieces, prawns and calamari as people requested. 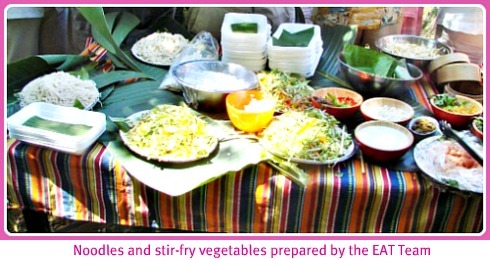 He added fresh sliced vegetables of bok choy, carrots, broccoli, onion, green beans and bean sprouts to which was added various flavourings such as Thai green paste, chilli, garlic, lemongrass, fresh mint leaves, coconut milk, soy sauce, oyster sauce and fish sauce. Finally the cooked noodles were added in. The tasty concoction was ladled into a simple take-away plate lined with banana leaves to be eaten Asian style with chopsticks! 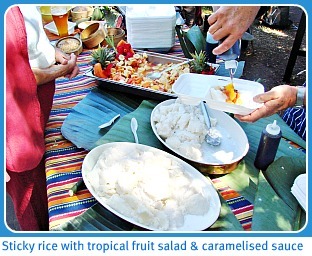 The dessert that followed was tropical fruit salad with sticky coconut rice and caramelised sauce. Another successful Slow Food workshop came to an end but people lingered enjoying the ambiance of the outdoors under the protection of the shady umbrellas. 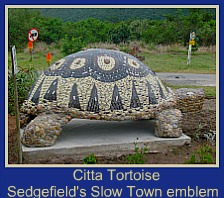 We are now getting attendees to our increasingly popular meetings from as far a field as Oudtshoorn and Plettenberg Bay. 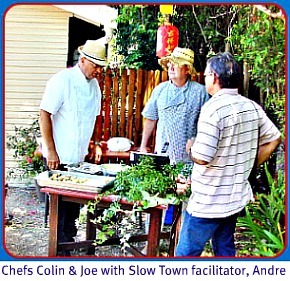 As we enter the second year of Sedgefield’s Slow Food Workshops we invite any interested restaurants that are prepared to offer themselves as a venue for our meetings to contact Colin Capon by emailing him at cjcapon@gmail.com whereupon he will be only too pleased to meet up and discuss possible workshop opportunities with them. December 2012 - Unfortunately this restaurant is closed until further notice.